Click here to view and interact with DICOM images for Figure 1 in the Exa™ viewer provided by Konica Minolta. A 49-year-old female patient with a history of irritable bowel syndrome (IBS) presented to the emergency department at our institution with worsening severe constant generalized abdominal pain radiating to the back that began in the epigastric region. She also complained of nausea, vomiting, and diarrhea. She stated that her pain was not controlled with Tylenol/Codeine nor with Donnatal prescribed by her gastroenterologist. She denied fever, chills, alcohol use/abuse, changes in diet, recent illness or sick contacts, mucous or blood in her stools, dysuria, or hematuria. On physical exam, the patient was tender to palpation in the abdomen, particularly over the epigastric region, with positive rebound and normal bowel sounds. The rest of the physical exam was unremarkable. Her laboratory exam demonstrated mild elevations of white blood cell count, lipase, AST, and direct bilirubin, as well as a negative urine pregnancy test. CT imaging demonstrated pancreas bifidum with asymmetric enlargement of the ventral limb of the bifid tail when compared to the dorsal limb (Figures 1,2). The ventral component demonstrates inflammatory infiltration of the surrounding fat, as well as several peripancreatic and intraparenchymal areas of hypoattenuation best appreciated on the sagittal projection (Figure 2) that appear to involve greater than 30 percent of the inflamed ventral limb per the Revised Atlanta Classification of Acute Pancreatitis,1 most compatible with small acute necrotic collections. These findings are consistent with mild acute necrotizing pancreatitis involving only the ventral limb of a bifid pancreatic tail. 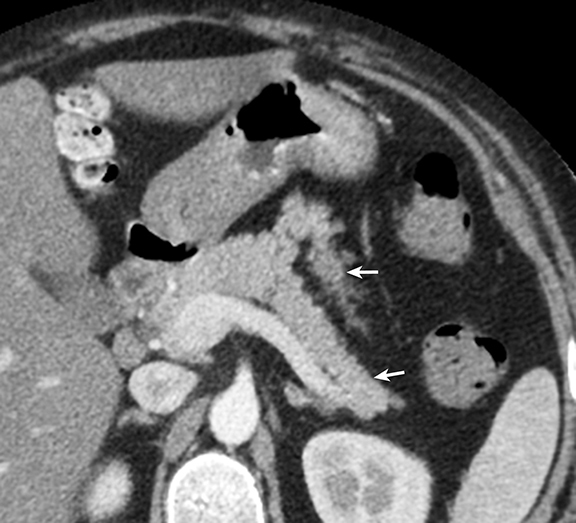 A follow-up CT exam (Figure 3) from approximately one and a half years after the current CT demonstrated a bifid pancreas, but no radiographic signs of pancreatitis or hypoattenuating areas. After gastroenterology consultation and appropriate follow-up care, endoscopic ultrasound (not shown) was performed six days after the patient’s presentation in the emergency room, which demonstrated a hypoechoic pancreatic collection containing echogenic material within. Fine needle aspiration was performed during the endoscopic sonogram retrieving 3 cc of purulent material, consisting mainly of polymorphonucleocytes per the cytopathological evaluation. The patient was started on Cipro 250 mg p.o. bid. for seven days, with further recommendations pending the patient’s clinical response and cytopathology culture results. The patient responded well to treatment and made a full recovery. Pancreas bifidum (also known as bifid pancreas or fishtail pancreas) is an exceedingly rare foregut anomaly, which comprises congenital branching of the pancreatic tail, including the main pancreatic duct.2 The entity has not been well investigated and is usually an incidental finding requiring no treatment. We found 12 case reports in the literature describing “pancreas bifidum” or a “bifid pancreas” or “bifid tail of the pancreas”, three of which were associated with pancreatitis,3-5 and only one report where the pancreatitis involved only a single limb of a bifid pancreatic tail.3 There was a single case report describing a bifid neck with a common head,6 and three cases describing bifid pancreatic ducts without mention of an actual anatomic bifid tail.7-9 The case that we are presenting in this report is believed to be the second case ever described that demonstrates acute pancreatitis in a single limb of a bifid pancreatic tail. Further, we believe that findings consistent with small acute necrotic collections localized to the affected limb make our case unique and the first to be reported. This case is being highlighted because of its novelty and in order to raise the following potentially relevant clinical questions. Does having a bifid pancreas predispose to a higher probability of developing acute pancreatitis or adversely affect severity in those patients that already have pancreatitis? If so, what steps could be taken to improve clinical outcome? Do patients with a bifid pancreas have a greater likelihood of having other concomitant developmental anomalies that may negatively impact the patient clinically? Does the presence of pancreas bifidum, by reason of its anomalous shape and possible increased volume/mass, predispose a patient to more severe organ injury in cases of blunt abdominal trauma? Granted, these questions are difficult to investigate and have questionable clinical significance with so few reported cases. That notwithstanding, one potential solution in assessing whether the anomaly predisposes to the development or worsening of pancreatic disease may be to assess the duct anatomy of patients with pancreas bifidum if and when they come to clinical attention. They could be evaluated for unusual ductal anatomy and/or other anomalous features that may predispose them to developing acute pancreatitis or result in prolonging or even worsening it if it has already developed. If a positive correlation is eventually discovered, consideration could be given to investigating possible preventative measures. In the case presented by Koyasu,3 the authors assessed the patient’s ductal anatomy with MRCP, but did not detect any abnormalities that might have contributed to the patient developing acute pancreatitis. Obviously, a single case is hardly precedent setting, raising the question whether patients found to possess the anomaly might benefit from investigative abdominal MR/MRCP. Perhaps as the number of cases of this entity grows over time, a clinical pattern may emerge that could help answer questions such as those detailed above and possibly assist clinicians in more effectively working up patients with this extremely rare developmental anomaly. Pancreas bifidum is an exceedingly rare foregut anomaly that has not been well studied. 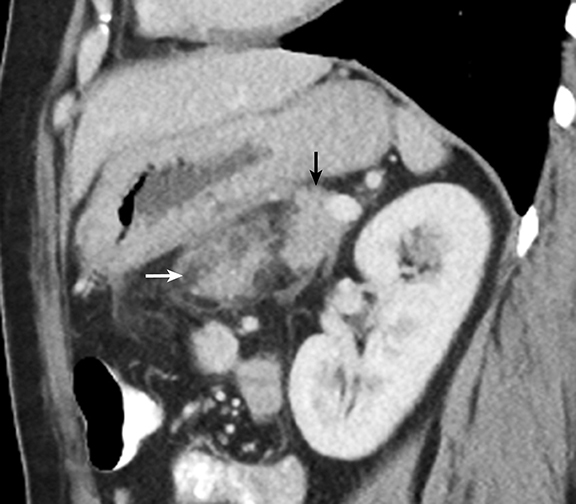 A case is presented of a 49-year-old female, with a history of IBS presenting to the ED with worsening severe abdominal pain, who is found to have acute necrotizing pancreatitis isolated to the ventral limb of a bifid pancreatic tail. 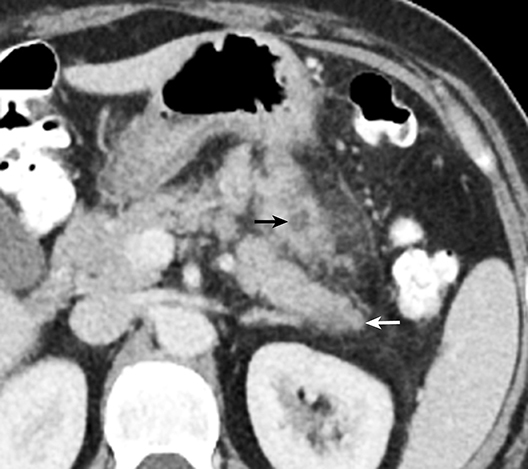 This report is believed to be the second case ever described that demonstrates acute pancreatitis in a single limb of a bifid pancreatic tail. Further, we believe that findings consistent with small acute necrotic collections localized to the affected limb, suggestive for a necrotizing component, make this case unique and the first to be reported. Thoeni RF. The revised Atlanta classification of acute pancreatitis: its importance for the radiologist and its effect on treatment. Radiology. 2012 Mar;262(3):751-764. Casillas J, Levi JU, Quiroz AO, Ruiz-Cordero R, Garcia-Buitrago MT, Sleeman D. Multidisciplinary teaching atlas of the pancreas: Radiological, Surgical, and Pathological Correlations. 2016;Verlag Berlin Heidelberg: Springer. Koyasu S, Isoda H, Nakase H, Kodama Y, Chiba T, Togashi K. Bifid tail of the pancreas with localized acute pancreatitis. Magn Reson Med Sci. 2013 Dec 25;12(4):315-318. Materne R, Clapuyt P, Saint-Martin C, Jespers S, Barrea C, de Ville de Goyet J, Gosseye S, Sokal E. Gastric cystic duplication communicating with a bifid pancreas: a rare cause of recurrent pancreatitis.J Pediatr Gastroenterol Nutr. 1998 Jul;27(1):102-105. Krishnamurty VS, Rajendran S, Korsten MA. Bifid pancreas. An unusual anomaly associated with acute pancreatitis. Int J Pancreatol. 1994 Oct-Dec;16(2-3):179-181. Ball CG, Schmidt CM, Lillemoe KD. A bifid neck of the pancreas. J Gastrointest Surg. 2010 Sep;14(9):1462-1463. Vasiliadis K, Papavasiliou C, Lamprou N, Delivorias P, Papaioannou S, Karagiannidis A, Makridis C. Double duct to mucosa pancreaticojejunostomy for bifid pancreatic duct following pylorus preserving pancreaticoduodenectomy: A case report. Case Rep Med. 2012;2012:657071. Tajima Y, Adachi T, Kuroki T, Tsuneoka N, Mishima T, Kosaka T, Kanematsu T. Intraductal papillary mucinous neoplasm of the pancreas with a bifid pancreatic duct. J Hepatobiliary Pancreat Surg. 2009;16(6):865-868. Yoshida T, Ninomiya S, Morii Y, Matsumata T, Arimura E, Hidaka H. Double duct-to-mucosa pancreaticojejunostomy for bifid pancreatic duct. Hepatogastroenterology. 2004 Jul-Aug;51(58):1196-1197. Weiner SL, Zinn KM, Olsavsky TD. Pancreas bifidum with acute necrotizing pancreatitis in a single limb. Appl Radiol. 2017;46(8):32-34. Prepared by Dr. Weiner while serving as Chief Radiology Resident at St. Vincent’s Medical Center in Bridgeport, CT.; and Dr. Zinn while an Interventional Radiologist and Dr. Olsavsky while a Radiologist at St. Vincent’s Medical Center and Advanced Radiology Consultants in Shelton, CT.